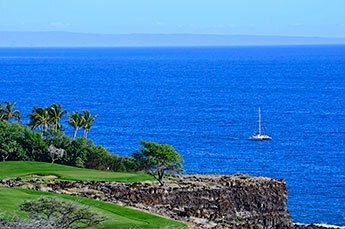 Come Play the Manele Golf Course Today, book directly with Expeditions. 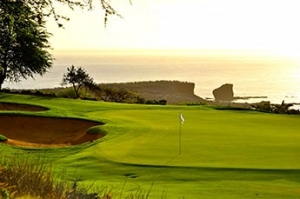 This par 72 course is built on several hundred acres of natural lava, terraced on a hillside overlooking Hawaii’s finest white sand beach, Hulopo’e Bay. A work of art designed by Jack Nicklaus, the five-tee concept challenges even the most experienced golfers with precise tee shots over natural gorges and ravines. 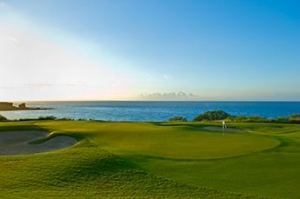 The par 3 Number 12 “signature hole” plays from a 150-foot cliff above the crashing surf, requiring a 200 yard tee shot across the ocean. Every hole guarantees golfers stunning views of the deep blue pacific where dolphins and whales are often sited during play. Includes Golf, Taxes, Ferry ride for one, transportation to and from harbor, continental breakfast, exclusive bag tag, and other amenities. 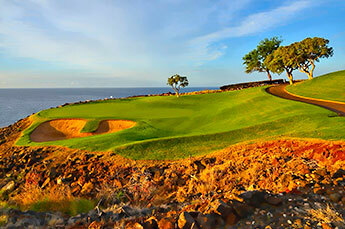 Call 800-695-2624 for Information on the Manele Golf Course.